StyleGuard Systems is a manufacturer and distributor of glass fence and railing systems, based in Los Angeles, California. We sell the best glass pool fence and railings in the industry. We work directly with you to design and deliver a premium, custom fence or railing system tailor made to fit your needs, exactly. StyleGuard Systems glass fence and glass railings are constructed using crystal clear 1/2″ thick tempered architectural glass panels. 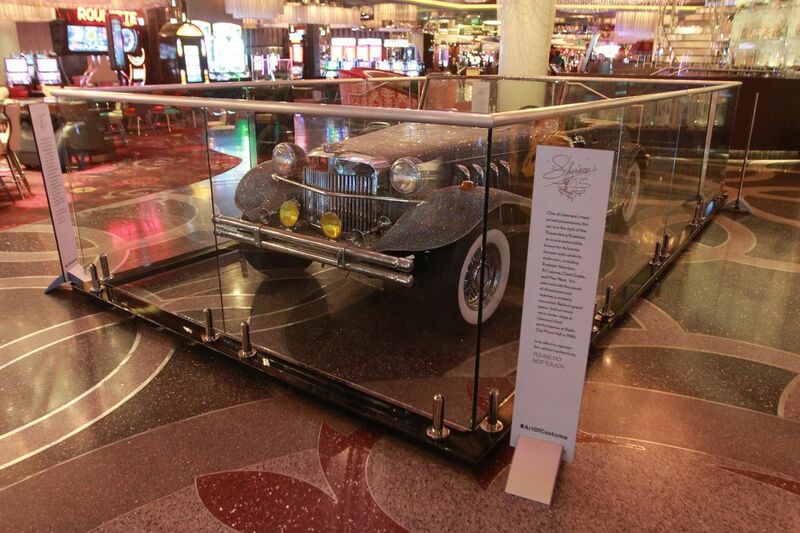 All glass panels are custom cut to the dimensions that best suit your needs. 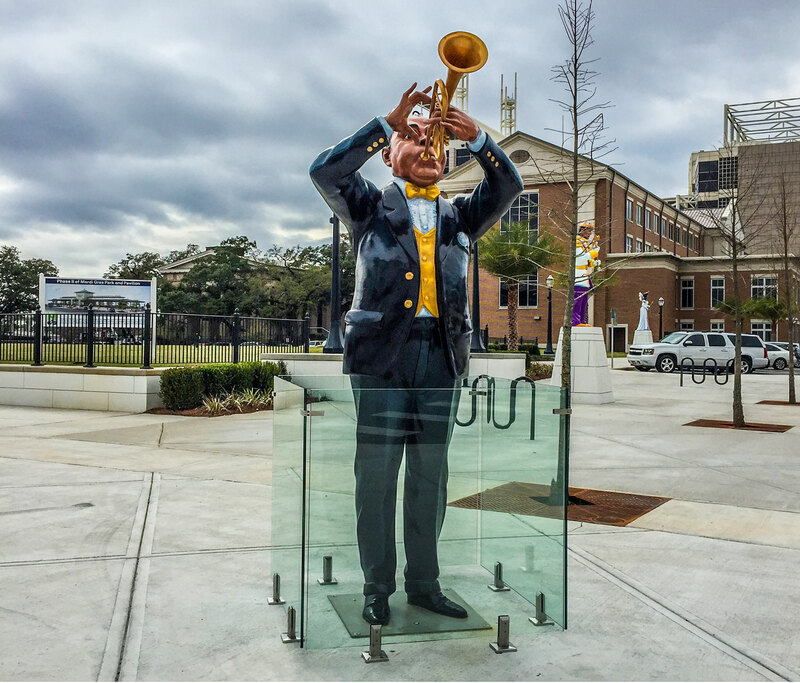 StyleGuard uses only the strongest toughened glass which is 8 times the strength of regular glass and therefore made to withstand years of use without degrading in condition. Our beautiful glass fence and railing panels are anchored by stylish and resilient stainless steel glass clamps or “spigots”. We use a variety of high grade steel all dependent on the intended placement and use of your glass fence or glass railing system. StyleGuard has been a mainstay of the glass fence and glass railing industry in the U.S. since it began. Through our history we have built an extensive network of fabricators and installers around the country which we extend directly to our clients. StyleGuard glass fence and railings are perfect for residential and commercial applications due to an equal parts form and function design. Every one of our systems is of the highest quality so wherever you decide to install one of our products you receive the best value for your budget guaranteed. Styleguard Glass Fence and Railings. The Clear Choice. Find out why. Frameless glass pool fence systems for pool & spas are an unobtrusive barrier which offer top rated safety without detracting from the natural beauty of your surroundings. StyleGuard frameless glass fencing systems are always custom and made to order which make them the right choice for any residential or commercial setting. Styleguard semi-frameless glass fencing offers architecturally pleasing hardware additions to the glass panels with choices of top, bottom and post rails for a dramatic outdoor environment installation. Whether a stainless chrome look for contemporary flash, or other choice of finish like brushed or powder coated to your choice of color, the result is a glass environment with extra panache. Nothing opens up architectural design like interior or exterior glass railings that allow an unobstructed viewing of an environment, whether entry to a commercial space atrium or a residential foyer. Glass railings are sleek and sophisticated and often used in contemporary design of museums and corporate offices. Glass railings also open up outdoor environments on multi-leveled beach houses and public viewing decks, and provide much needed wind resistance. Styleguard believes that glass railings are a clear choice for many applications. Think balcony. Think staircase. Think high-rise terrace. Think making the most of the view, and the experience. Designed with children in mind. Our glass fencing is built with solid 1/2 “ tempered glass sheets cut to 4’ or 5’ in height. They are built to last and keep children safe. 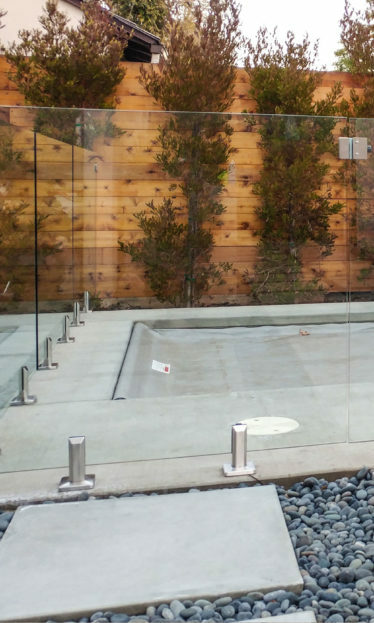 Our glass pool gates are equipped with specialized hinges and locking system that offer the highest level of security, making them the most secure in the industry. Keeping your family safe is the number one priority. Our glass fence and railing systems maximize utility while minimizing installation materials. This enables fast and easy installation that will leave you with more time to enjoy your backyard oasis. Our frameless glass fence and glass railing systems provide a seamless view of your surroundings which makes even the tightest of spaces feel wide open and expansive. Start the process today and see the difference. Our glass fence and railing systems are made with premium glass and stainless steel hardware. This means that they do not deteriorate over time unlike like mesh and iron fences that corrode and need to be repeatedly replaced. Your fence will be standing for the life of your pool. 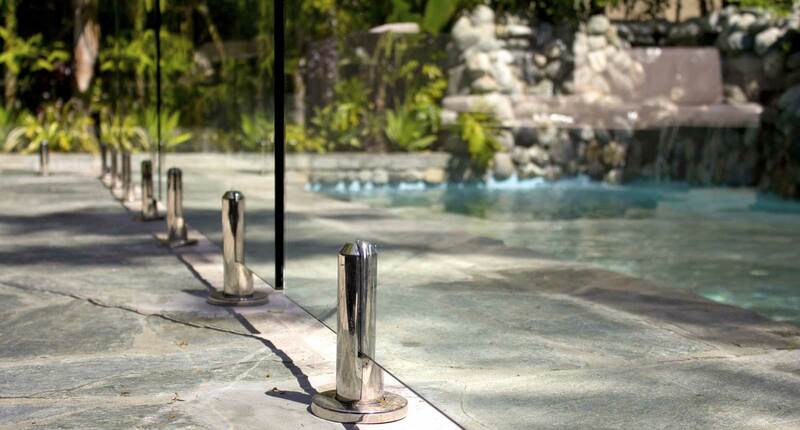 We were the first to bring frameless glass pool fences to market and have continued to be pioneers in the industry. 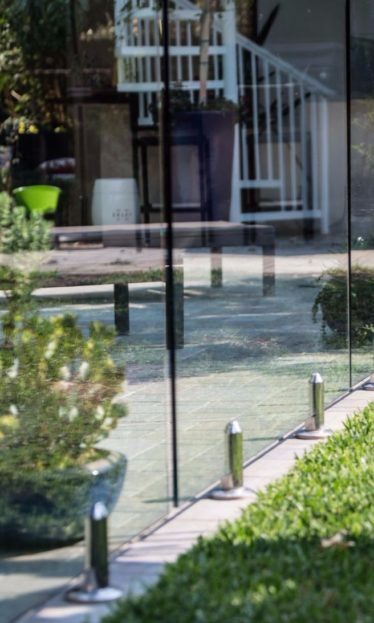 Our glass fencing systems are created and designed with the highest quality hardware that has now become the industry standard for our competitors. Our frameless and semi frameless glass fence and glass railing panels are custom made from hand cut sections of tempered glass. This ensures a perfect fit into our specially designed stainless steel anchor clamps to provide equal parts luxury and security. Each system is uniquely designed to fit your needs. We offer the best price GUARANTEED on all of or our glass fence and railing products. If you find a better price, we will beat it! Simply share the quote with us and we will discount accordingly to give you the best price possible. “Our experience with Style Guard was terrific. My wife and I had our first child a year ago and we wanted to protect him from the pool without installing an ugly steel fence. The brilliance is in the simplicity. I had a small area to work with, so I was skeptical, but the creative team at StyleGuard impressed me with their ingenuity. I still enjoy my glass railings every time I walk into my condo. Working with StyleGuard Systems and in particular, the owner, has been a wonderful experience. The company was professional, thoughtful and creative. Our glass pool fence has become the highlight in our backyard. 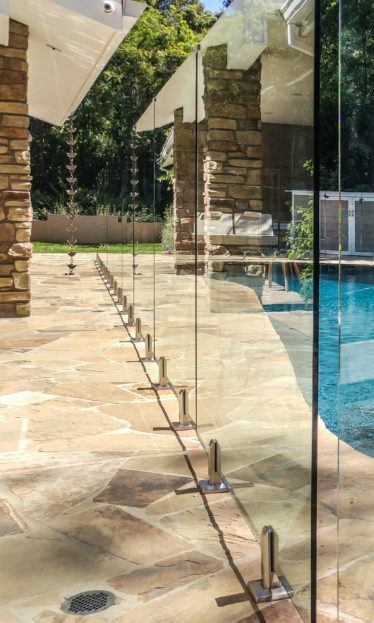 My husband introduced me to the idea of glass fencing for our pool. I wondered how safe it would be for our two kids. We met with several companies and none of them fit exactly what we were looking for until StyleGuard. It’s been great – they are super helpful and even now after 6 years with the fence they still check in to make sure we aren’t having an issues. I highly recommend StyleGuard.